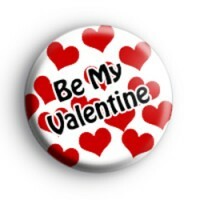 This is a listing for a 1-inch button badge with lots of red love hearts & the slogan Be My Valentine in bold black lettering. If you're making your own Valentines card this year then this handmade Valentines badge would be so cute pinned to the front. If you're loved up this year and want to use our badges as thoughtful tokens of love then make sure you check out our other love-themed badges - we have some super cute designs to pick from. All our Valentines badges are handmade in the UK.